Navigate: Home / Brands / LoJack / LoJack For Laptops Premium Student Edition (CD) - ON SALE! We Get Stolen Laptops Back! - Works with PC's and Mac's! Every 50 seconds a laptop goes missing. Every day hundreds know the panic laptop theft brings. Only LoJack for Laptops has a dedicated Theft Recovery Team that works to find and recover your stolen laptop, while giving you tools to remotely protect your private and sensitive data. For most people, the odds of recovering a stolen laptop aren't encouraging. But every year, thousands of people get their stolen laptops back, thanks to our patented technology and experienced Theft Recovery Team. If your protected computer is stolen, the team can use our technology to track it, and work with local law enforcement to get it back in your hands. 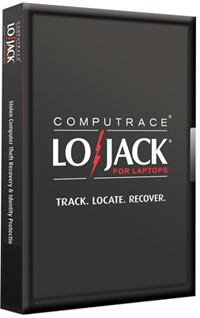 Get LoJack for Laptops and flip the odds in your favor. You may not have your computer with you, but you can still feel safe from prying eyes. Use Device Lock to block your computer remotely, denying potential identity thieves access to your computer and personal data. You can also choose to display a customized lock-out message onscreen. You could, for instance, display contact information that would help a good Samaritan return your computer to you. The contents of your hard drive might be worth more to you - and a thief - than the laptop itself. But our Data Delete feature helps you prevent costly and traumatic identity theft. With it, you can remotely and selectively erase sensitive files, personal photos, financial data, and stored passwords. So you stay safe and in control. Is your laptop really stolen? Or did you leave it on a business trip? Using GPS or Wi-Fi geolocation, LoJack for Laptops can map and display your laptop's current and past whereabouts. So you'll know whether it's simply left behind, or something more serious. Even when your laptop is safe and sound, you can see that LoJack for Laptops is on the job. Note: Standard edition does not include location history. With our leading technology and experienced Theft Recovery Team, LoJack for Laptops gives you unsurpassed theft recovery service, plus device and data protection. Choose our Premium edition and get our Service Guarantee. If we don't recover your stolen computer or enable the Data Delete service, you could be eligible for a Service Guarantee payment of up to $1000. Conditions apply so please read Lojacks Service Agreement. "My grandson's laptop was stolen the day before he was leaving for his freshman year. Within three weeks we had the laptop back. Thank you. Well worth the price."